British hostage John Cantlie has appeared in a new Islamic State propaganda video released by the extremist group on Monday. “Inside Aleppo,” Cantlie says, will be the last in this series. 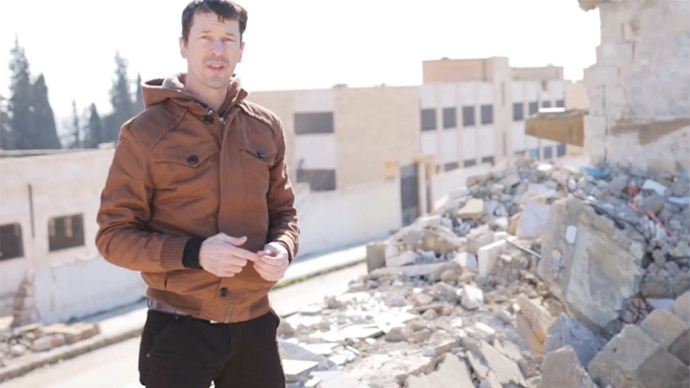 In the video, the captive journalist walks through the rubble of heavily bombed Aleppo, titled ‘Inside Haleb.’ Cantlie appeared in a number of similar videos last year. In the latest video, Cantlie wears civilian clothing. In previous episodes of the “series” he wore an orange jumpsuit, in reference to the clothes Guantanamo Bay detainees have to wear. He also talks about drone surveillance of the area by coalition forces and drone strikes against IS. Cantlie claims the jihadists are not affected by the bombings and often “enjoy a relaxing cup of tea,” continue to build new homes in Aleppo and just “get on with” life. Cantlie also explains Islamic concepts in the video, such as Sharia Law. He is seen sitting among Muslims inside a Sharia court, explaining that while the punishment for theft – cutting off a hand – seems “harsh,” the offender will at least not do it again. The Islamic State has held Cantlie captive for more than two years. Previous videos include a series titled “Lend Me Your Ears.” Later installments include “Inside Ayn al Islam,” also known as the Syrian city of Kobani, and “Inside Mosul,” the Iraqi city. The video’s release comes just days after the alleged death of US hostage Kayla Mueller. It is believed Mueller was killed inadvertently during a Jordanian airstrike on the Islamic State in Syria.